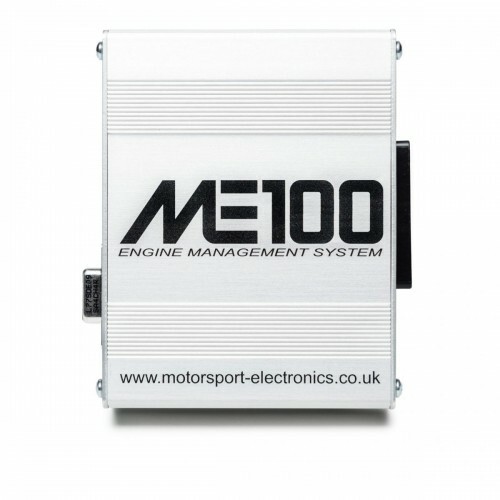 The ME100 is the latest ignition control system from Motorsport Electronics and available from us here at danST Engineering. This ECU is ideal for use with our popular bike carburettor kits as an alternative to the NODIZ Pro -especially in applications where full VVT control is required. Designed for fully sequential control of four cylinder engines, it is a feature packed ECU offering all of the features of the highly successful ME221 Fuel Injection ECU (but without fueling control), in a compact, reliable and affordable form factor. Supplied with a fully terminated ST170 loom this ECU is unbeatable value for money for anyone looking for full VVT control and ignition management all in one box! Added to this we can offer an upgrade to full ME221 spec at a later date should you wish to upgrade to fuel injection. The ME100 uses the same MEITE tuning environment as the ME221 and thus offers features such as Closed Loop Boost & VVT as well as Windowed DSP Knock Control, through to core features such as programmable inputs, custom tuneable sensor tables and full 3D mapping. Essentially any four cylinder engine, either turbocharged or normally aspirated can be ran semi or fully sequential with an array of motorsport features to boot, all powered by the ME100 ECU. This system includes the ME100 ECU, ST170/Zetec Wiring Loom RS232 Tuning Cable & Quick Start Sheet. The ECU requires inputs from a crank sensor therefore if your engine is not equipped with a sensor you will need to mount a suitable sensor and trigger wheel on your front pulley. The ECU also requires inputs from air and water temperature sensors. If your laptop is not equipped with an old style RS232 port you will need a genuine FTDI serial adapter cable if you wish to connect to the ECU. All of the above can be purchased online from danST engineering-please see our other shop items. Note: As with all after-market engine management systems (ECU’s) a dyno tuning is recommended to avoid damaging your engine and to get the most out of your engine. A full range of basemaps are available from danST engineering or Motorsport Electronics.